Project X Ltd. is pleased to announce that we will be returning to MicroStrategy World 2017 as an exhibitor along with our friends from Mighty Wizards. This year World takes place in Washington, DC from April 18 – 20 – we are located at booth #420. Throughout our 11-year history, Project X has been a close MicroStrategy reseller and partner and has worked with dozens of organizations across North America to implement, customize, and optimize their analytics environments from end-to-end. Through our subsidiary Project X Labs we also work to create MicroStrategy solutions that extend the platform to deliver valuable insights, such as GeoDash, IntelliSite and ClickAlytics. 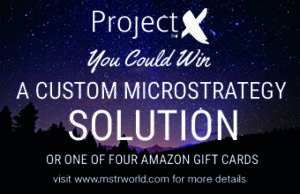 Project X is always looking to create the next big innovation in MicroStrategy, and we need your help. We’re offering a prize for the most compelling MicroStrategy business case unique to an organization’s needs between now and the end of World 2017. What do you win? A solution! The winner will receive a complete, tailor-made proof of concept, and four other entrants will win a $50 Amazon gift card. Simply e-mail your full name, company, and description of your organization’s unique MicroStrategy business case to contest@pxltd.ca before April 28, 2017 for a chance to win – please note you do not have to attend World to enter this contest. One of our clients will be presenting their mobile BI solution that integrates Project X Labs’ geospatial analytics tool GeoDash. Join us at this session to learn best practices for implementing mobile BI and how location intelligence can help end users make smart business decisions. Coming to MicroStrategy World? We have a large array of products and services available to maximize your MicroStrategy usage. Contact our sales team to book a one-on-one demo of our offerings – let us show you how to get the most of your MicroStrategy environment. Planning to attend and want a discounted pass or connect with us at the event? Drop us a line!